I have a number of tattoos. 15 to be precise - I count them in my head sometimes because it gives me a thrill to mentally scan my body and remember all the lovely little pictures I’ve put on it. I’m slightly surprised that I have as many as I do - I never set out to, and I certainly don’t have a vision of being covered head to toe in ink. But perhaps one day that’s how I’ll end up. Who knows! I got my first tattoo when I was sixteen. It is a tiny boat on my foot - a drawing that I used to draw a lot. I’m not sure what spurred me on to get it, except that I thought it was cool and once it was in my head I couldn’t shake the idea. This is what has happened with all the tattoos I have gone through with - the idea pops into my head and then it never leaves. Plenty of other ideas pop and go, but a few end up here to stay. 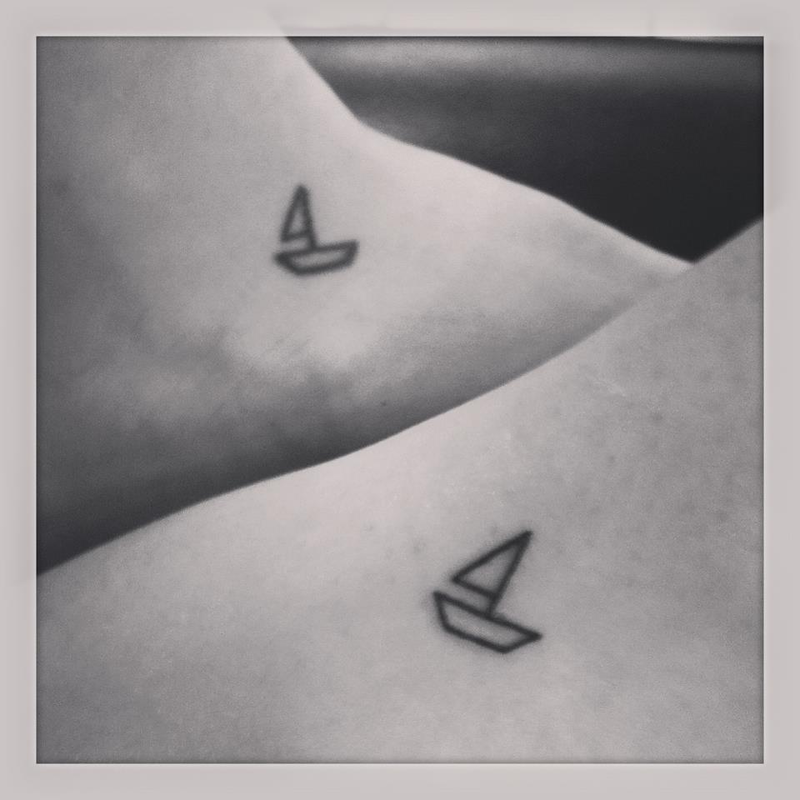 A fun fact - I swapped tattoos with one of my favourite people in the world and now we both have tiny boats upon our feet. After my boat I got a few more doodles, before getting my first big one of a cormorant fisher on my side by Jack at Dead Slow. It was inspired by an image I saw in Shanghai Art Gallery, whilst realising my life was my own to do what I wanted with. It felt like a big reclamation to put a huge swathe of black on my side, and it delights me every time I see it. My tattoos recall times and places. I suppose that is inevitable. After our beloved family dog died, I had him tattooed on my foot looking up at 6 hot air balloons floating up my side. I got this at a time I was in my first job, getting a real sense of independence and freedom alongside the sorrows of losing a loyal friend. After I finished my English Literature degree, I had a huge stack of books tattooed up my back (also by Jack). This is The Tattoo that I’d always wanted, since I first discovered tattoos were a thing, and it still thrills me that it’s finally there. Once, when I was recovering from a painful break-up and a brief time spent staring into the abyss, Ant surprised me by posting me the book ‘Hope in the Dark’ by Rebecca Solnit. I loved the book and the gesture so much that I got the cover tattooed on my arm (again by Jack!). You can see it in the picture above. Be warned - if you send me any artwork it may end up inked onto my skin. I have several tattoos which are matching with people who I love dearly. There’s something magical about getting matching tattoos - the planning, the establishing that you both are really truly serious about it, and the event of getting them together! Most importantly, taking reminders of wonderful women wherever I go. Speaking of women, I have two in tattoo form. On one arm, a beautiful water nymph done by my friend Ella. On the other, the front cover of The Habit of Loving by Doris Lessing tattooed on me by Kirsty at Dead Slow. I didn’t realise at the time, but now I feel like they reflect two sides of me - the side that loves independence and alone time, and the part that loves a cuddle. Having said that, although my tattoos mean a lot to me, I don’t assign huge meaning to them and I’ve found that what they mean changes over time. Generally I just love the look of them. My most recent addition makes me smile. 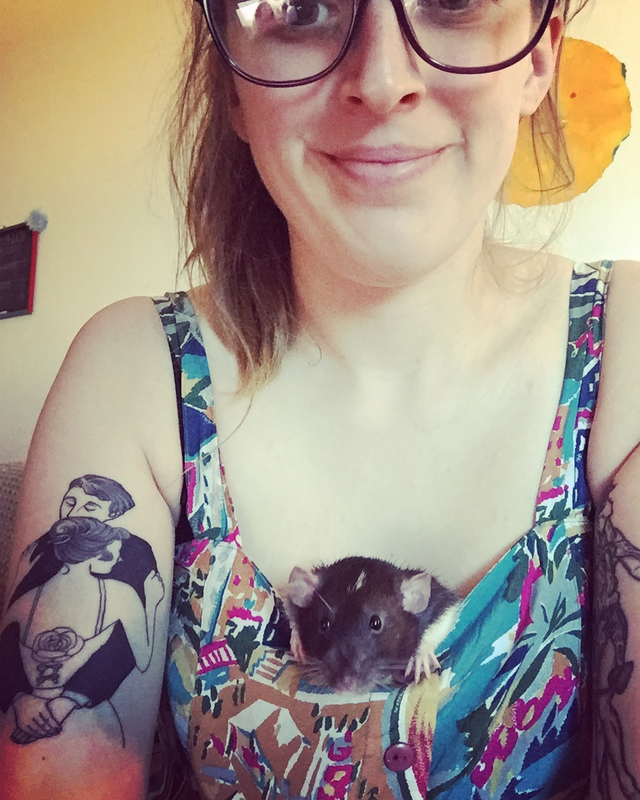 A tribute to my beautiful girl Mariella, and the hamsters who I have had the privilege of knowing through the years. This one is hand poked by Tim - Prison Style Tattoo. There you are - a tour of some, but not all, of the pictures I’ve decorated myself with. I adore having my tattoos - I love looking at them, I enjoy the process of getting them, and I appreciate the conversations they start. It’s certainly an expensive hobby, but I figure it’s a lifelong investment. Here’s to loving the skin you are in, and covering it in doodles if you want to.